In bicycling you have what are called “No Chain Days”, essentially a day on the bike where everthing was so effortless that it felt like you were pedaling without a chain. This week’s meal was like that. I had no problem getting the kids to eat all their dinner and they eagerly went back for seconds. 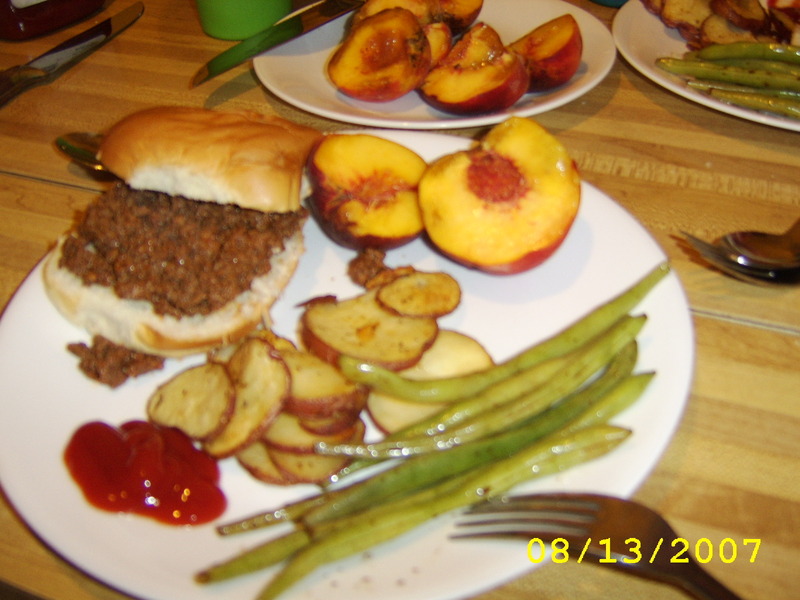 We had sloppy joes (using the handy recipe from my trusty Betty Crocker book), buns from a local bakery, roasted green beans and baked fries. The peach came from my father in law’s peach tree. Not local were the ketchup, salt and pepper and olive oil. Yum-O!! This entry was posted in Cooking, Eating Locally. Bookmark the permalink. I’m cannot believe you needed to dig out B.C to fix sloppy joes!! Hey! I’ve never made sloppy joes before without using the goo in the can. This is a big step! I have never used the goo in the can. Maybe a can of tomato paste but never the so called SloppyJoe goo in the can. I agree Stacie–She’s just jealous because her son is a better cook then her! Ah, kitchen wars. I used to get this from my mom as well. 🙂 So glad she does not blog.